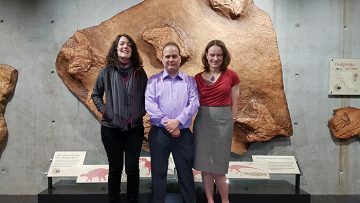 Tammy Pigeon, Richard McCrae, and Lisa Buckley of the PRPRC at the Dinosaur Trackways opening. Dinosaurs are always crowd pleasers and last Thursday’s Nocturnal offering at the Beaty Biodiversity Museum (BBM) was no exception. Over 140 people attended the opening of our new Dinosaur Trackways exhibit, which features three separate dinosaur trackways from British Columbia’s Peace River region and southeastern BC, and which range from 93 to 140 million years old. Visitors were treated to comments by Dr. Lisa Buckley from the Peace River Paleontology Research Centre (PRPRC) in Tumbler Ridge, BC, on the three trackways now at the BBM and then to a fascinating talk by Dr. Richard McCrae also of the PRPRC on some of their dinosaur trackway work in the Peace River area. This was followed by a very entertaining talk on dinosaur behaviour by Lisa on the following Sunday in the BBM’s “Way Cool” series. The trackway project is a partnership between the PRPRC and the BBM that began over two years ago and was funded, in part, by generous private donations. One of the goals of the project was to create a display that would highlight the biodiversity of dinosaurs from BC’s interior and the insights into their biology that can be gleaned from observing the preserved tracks of these iconic animals. A project 140 million years in the making is now ready for viewing at the BBM!